LAIMONAS BRIEDIS, the author of Vilnius: City of Strangers and the guest editor of this issue, is currently working on a project to create a literary map of Vilnius and the cultural cartography of the Lithuanian diaspora. He divides his time between Vancouver and Vilnius. There is no great mystery behind the meaning of the name Belarus, which in every Slavic language can easily be deciphered as White Rus. The evocation of the color white in the title of the country might bring to mind a picture of an achromatic landscape with unstained, seamless nature. There is a certain degree of truth in this perception, since Belarus, for the most part, is a country as flat as a sheet of paper. The country is extensively covered by vast forests and swamps, only occasionally broken up by rivers lazily flowing to the Black or Baltic Seas. In spring, which usually arrives late in Belarus, the rivers swell into the forest, spilling into the marshes and bogs, submerging the countryside in a pitch-grey sludge of murky water and earthy elements. The flooding can last for months: the smooth topography and rainy weather of Belarus encourages stagnation, with no routes of escape for either the water or the trapped inhabitants of the countryside. Indeed, ancient cartographers drew parts of the contemporary territory of Belarus as if it were a geological relic of the Biblical deluge, a grand inland lagoon – terra acqua, a waterland – sloughing across Europe like a monstrous beaver pond. The maps gave Belarus the impression of a Nordic Amazon: an empty, untamed, and somewhat dangerous and mysterious wilderness with only a few scarcely populated towns or villages. Seasonal overflows are still a yearly episode in Belarus and in spring, the countryside acquires a brownish-green tone. 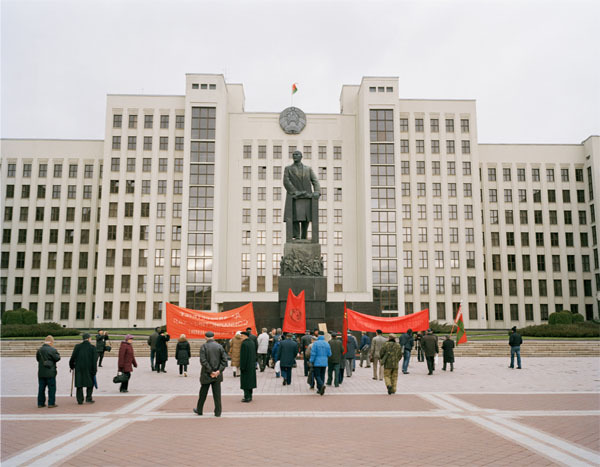 Overall, though, grey hues govern Belarus, especially its history. Browsing through old cosmographies of the world, it is easy to notice that White Russia has no fixed history. For centuries, Belarus has been a country in motion, a fluid concept with a predisposition to move westwards. Until the seventeenth century, White Rus – Ruthenia Alba in Latin – denoted the territories of the Russian principality of Moscow. The albescent Rus was in opposition to Black and Red Ruthenia, its westerly and southerly cousins, modern-day western Belarus and Ukraine. This color contrast made perfect sense considering the icy climate and long winters of the northerly latitudes of Muscovy. (Fittingly, the White Sea – the Baltic – shouldered the region of Ruthenia Alba.) Yet, as often happens in the areas of great distances, shifting loyalties in subsequent centuries moved the geographical location of White Russia closer to Lithuania, Muscovy’s rival for the lands and title of Ruthenia. It took another century for White Russia to jump across the historical frontier separating Lithuania from Moscow and become more closely associated with the easterly provinces of the Polish-Lithuanian Commonwealth. From the fifteenth up until the early part of the nineteenth century, most of the contemporary territory of the Republic of Belarus was referred to and known as Litva, or Lithuania. The final split between Lithuania and Belarus only occurred with the emergence of national – linguistic and ethnic – consciousness among Lithuanians and Belarussians some hundred years ago. The current (political) border between Belarus and Lithuania has no trace of historical legitimacy, except for the fact that it was penciled in by the Soviet regime. Puzzling as it is, the cartographical move of Belarus westwards imbued the meaning of white in the title of the country with new connotations. In the historiography of Russia, the color white came to be associated with purity, that is, an unadulterated form of the early Slavic (and Christian) society saved from the despondency of the Mongol suzerainty. In essence, the existence of White Russia exemplified the continuity of the early Kiev Rus traditions, if not in political life, then at least in its religious spirit and population stock. Ancient Rus – the cultural prototype of Russia, Ukraine and Belarus – was initially built as a Viking (Nordic) community, greatly expanded across vast stretches of Eastern Europe by conquering and uniting different pagan Slavic societies. Modern ethnographers have been quick to point to the flaxen complexion of the natives of the country and/or their unadorned – colorless, whitish – traditional linen garment as the evidence of the northern (and white) origins of the Belarus. This observation suggests a certain degree of “genetic isolation” and the “cultural innocence” of the Belorussian population. Such a claim, of course, is a far cry from true, for Belarus has been probably one of the most war-ravaged provinces of Europe, continually crisscrossed by foreign powers. In its recorded history, the population of Belarus has never been ethnically, linguistically, racially, or religiously homogeneous. For centuries, White Russia was home to Slavs, Balts, Jews, Tartars, and Roma. Here, as much or more than anywhere else on the continent, different religions – several denominations of Christianity, different groups of Judaism and Islam – took root. Belarus had always been a colorful amalgamation of languages, customs, traditions, and histories, a “divided” place where east and west meant more than just geographical direction. The fatal curses of the modern age, World War II in particular, united White Russia. War dyed Belarus in monochrome: a bare, unacknowledged territory on the conscience of Europe. The blood of the Stalinist and Nazi terrors washed Belarus with mass exterminations and total annihilation of its cities and villages. It made the country a lonely, emptied place where the dead sought to outnumber the living. Afterwards, the Soviets painted White Russia grey, forging out from the ashes of war ruins an exemplary landscape of socialist banality. The geographical elasticity and historical perforation of White Russia is a good indication of the country’s post-Soviet present. On the political map of Europe, Belarus is a fresh state, albeit with a tendency to reassign itself a great tradition of ancient pedigree. The newly established Belarussian state is not unlike a tabula rasa, a canvas ready to be painted over. Most states start this way, but in Belarus, the past has been so unkind to its people that it often makes historical facts unbearably hard to grasp. As a result, history in the Republic of Belarus is a creative act, an aesthetic and very often phantasmagorical pastiche of known and imagined, horrible and idyllic. It is a fascinating, but at the same time, alarming terrain, an icy landscape of colorful deceptions. On the other hand, driven by personal experiences, local people are far more resilient to the official whitewashing of history. In Belarus, though, memory is vague, oblique, and unreliable – people with tragic histories usually do not go deep into memories, for to outlive a past of terror, destruction, and humiliation, one needs to erase a lot of pain. Hence, for the people of Belarus, memory is something to forget. To look forward, anticipating the warmth of the coming summer, promises a possibility of escape, a brief respite from the unwelcome bleakness of the long winters of history. Hence, in White Russia, memory is a country of improvisation: a personal patch of the motherland. History and memory, unlike winter and summer, are not worlds apart; and in Belarus, the state and people come together by welcoming the invariably late arrival of spring. It is a brief, reserved, and somewhat mistrustful embrace, verging on effortless banality with a predictably fruitless conclusion. But just the same, spring celebration opens space to people, a treat in a country of grey expectations. Photographer Andrew Miksys, a seasoned traveler, ventures into the spring of Belarus with the eye of a magician. He knows the local terrain well: the distant officialdom and intimate circles, public and private, open and secret, cynical and welcoming, recorded and discarded, winter and summer, the risky future and the scarcity of hope. In search of the space in between, he builds his itinerary as a conceptual trick, following the ideological formulas in expectation of finding the human landscape. Thus, his photographs are not so much a record of Belarus in bloom – an archive of an official jubilation – but a diorama of the solitude of the celebration. Elegiac in color, this marvelous exposé registers Belarus in disjunction. 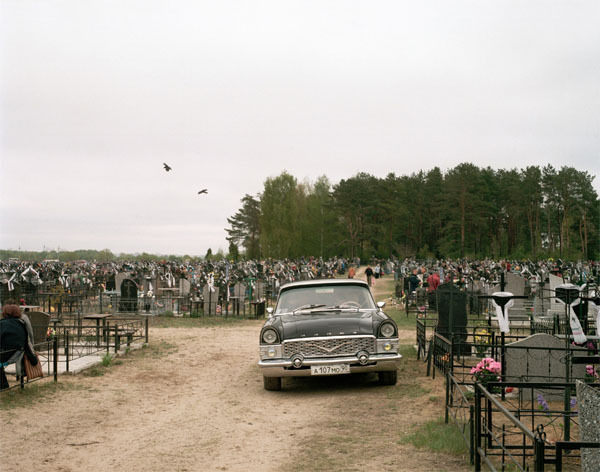 In his photographs of national holidays, however, Miksys enters not only the fractured nature of Belarus or its inherently split personality, but also the twofold reality of the country. Spring slips into Belarus with the advent of May Day, confusingly rebaptized as Work Day. It is a national holiday, with most people having the day off. The holiday, during Soviet rule known as the International Workers Day, has changed not just its name, but also its ideological meaning and festive character. Of course, May Day is a foreign – international – affair, because it commemorates the Haymarket massacre of protesting workers in Chicago on May 1, 1886. May Day has anarchist origins, but was eventually taken by the Second International as a day of protest, displaying the unity and strength of the proletariat of the world. It quickly spread throughout Europe, including the Russian Empire, which at the time was the governing power of White Russia. The hallmark of the May Day celebration was a street confrontation between authorities and working-class demonstrators. In general, though, the majority of the Belarus population – overwhelmingly peasants – was ignorant of the holiday and its ideological associations. Nonetheless, shortly after the October Revolution, during the first spring season of the Soviet regime, May Day, as the rite dearest to the Bolshevik theory of world revolution, became an official holiday. In subsequent decades, it ballooned into a proletarian gala, with the Communist oligarchy on pedestals and the working class streaming by in an ocean of red banners, flags, and plastic flowers. Depending on the momentary flavor of the party, upraised islands of millions of reproduced pictures of Lenin, Stalin, Marx, Khrushchev, Engels, and/or Brezhnev paraded past. Nowadays, May Day is still a holiday, but a lethargic one. Marching orders and forced jubilation are things of the past, replaced by cheerless outdoor performances and lifeless street markets. Work Day became an idle affair, even to those tattered old souls who still wave red as the color of their Soviet dreams. Radunitsa, the primordial Slavic holiday commemorating the inevitable power of death, is something from another planet. It is a buzzing, almost jovial day, gathering crowds of people in cemeteries. 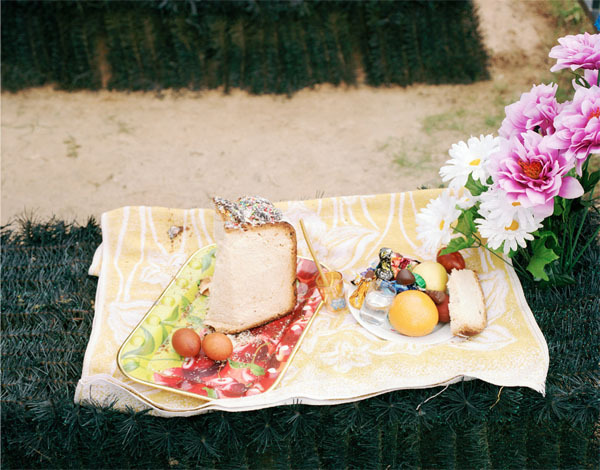 Locally know as Easter for the Dead, Radunitsa follows the Russian Orthodox liturgical calendar and is always celebrated on Tuesday, nine days after Easter Sunday. The origins of the holiday are unclear, but since time immemorial it has been a social and religious fixture in White Russia. Incidentally, Belarus is one of the few countries in the world officially celebrating both the Catholic All Souls Day, known as Dziady, and the Russian Orthodox Radunitsa. The difference between the two is striking. Dziady is the forewarning of winter and darkness; Radunitsa is all about spring expectations. A Byelorussian proverb states that, on Radunitsa, the morning is the time to be toiling, the afternoon weeping, and the evening carousing. The old wisdom still holds true in post-Soviet Belarus, where Radunitsa is acknowledged and, to a different degree, celebrated by almost everyone: Christians, Jews, nonbelievers, old Communists, and especially Roma. Often, it is a colorful, crowded holiday, a pageant of family reunions and public displays of mortuary grandeur. Picnicking at the grave sites of the dearly departed is a must, and no one dead can be recalled without a shot of vodka. The more spirits one greets, the merrier one gets… Radunitsa, meaning “a joyful affair,” outlasted Soviet censorship and has sprung back to life as a reminder of the passing order of everything earthly. It is a day of memory, an antidote to history. But Victory Day was never just about commemorating the war dead or remembering the sacrifice of the (Soviet) nation, and Moscow has always been the august stage for the celebration. The primary ideological goal of Victory Day was to flaunt the military strength of the Soviet state, to demonstrate to the citizens of the country and the rest of the world the perpetuity of communist power. The disintegration of the Soviet Union robbed the holiday of its solidifying effect, making it a souvenir from the thundering days of the past. Yet in post-Soviet Belarus, Victory Day is still greeted with a military parade, a distant cannon of totalitarian ideology. But with few living witnesses to the war (and even fewer veteran soldiers) mingling around, the carefully orchestrated and monitored celebratory mood of the holiday camouflages the loneliness and isolation of memory. Tinted with nostalgia, Victory Day is an edifice of the expired Soviet history, a skeleton keeping Belarus a separate nation. In contrast, the Day of the Republic is a novel and hurried invention: a gift from the president of Belarus to the nation. Also known as Independence Day, it became an official holiday some fifteen years ago as a commemoration of the liberation of Minsk by the Red Army on July 3, 1944. Predictably, Independence Day is saluted with a grandiose display of armament, the corroding surplus of the Soviet mind. Modern White Russia can be summarized with a single world: bilocation, that is, the ability to appear in two places at the same time. Bilocation is usually encountered in religious, especially Christian, mysticism, where it usually signals saintly behavior. But it is also a marker of black magic: witches have traditionally been charged with being seen in two places at once as a proof of their satanic power. In brief, bilocation is an extraordinary condition, always demanding a double verification of an appearance. No single witness can reliably testify in a case of bilocation. 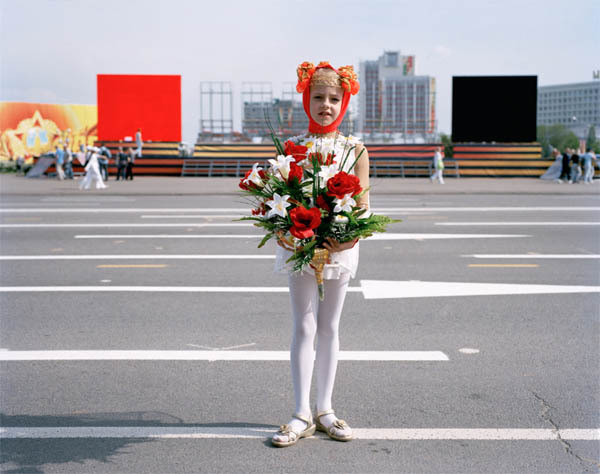 Miksys, however, was able to capture the dual reality of Belarus by simply focusing on the commonplace in the celebratory. ANDREW MIKSYS is the author of BAXT (FATE), a book of photographs about the Roma (Gypsies) of Lithuania. He was a Guggenheim Fellow in 2000 and was twice awarded Fulbright grants. His work has been shown internationally, including exhibitions at the Seattle Art Museum, Kominek Gallery (Berlin), and the Vilnius Contemporary Art Centre. He currently divides his time between Seattle and Vilnius. 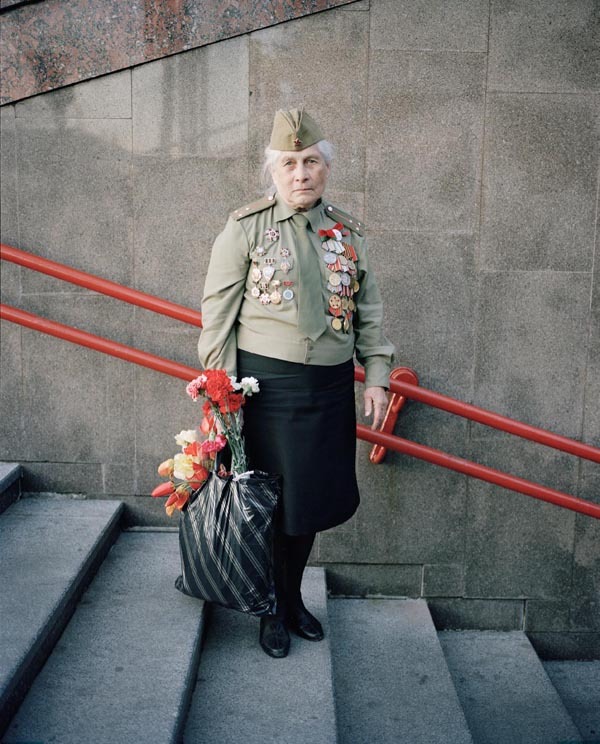 Veteran, Victory Day, Minsk, 2010. Lenin Statue, October Revolution Day, Minsk, 2010. 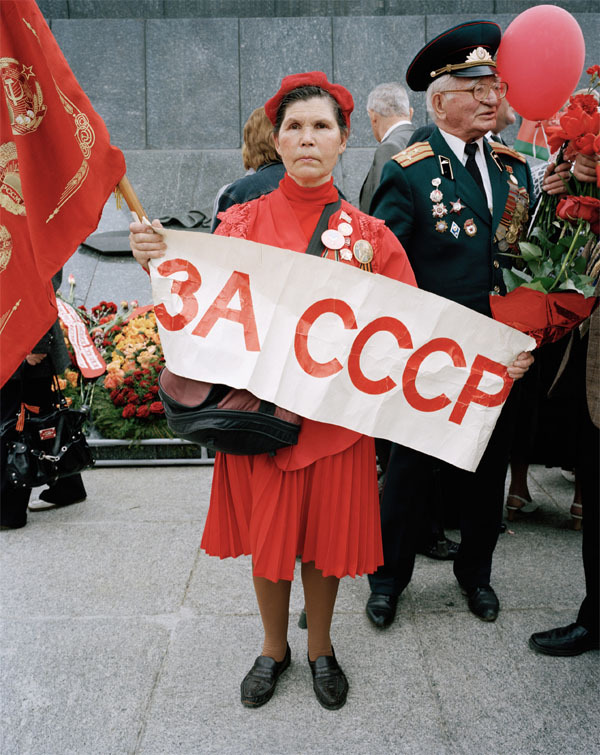 “I Support the USSR,” Victory Day, Minsk, 2009. 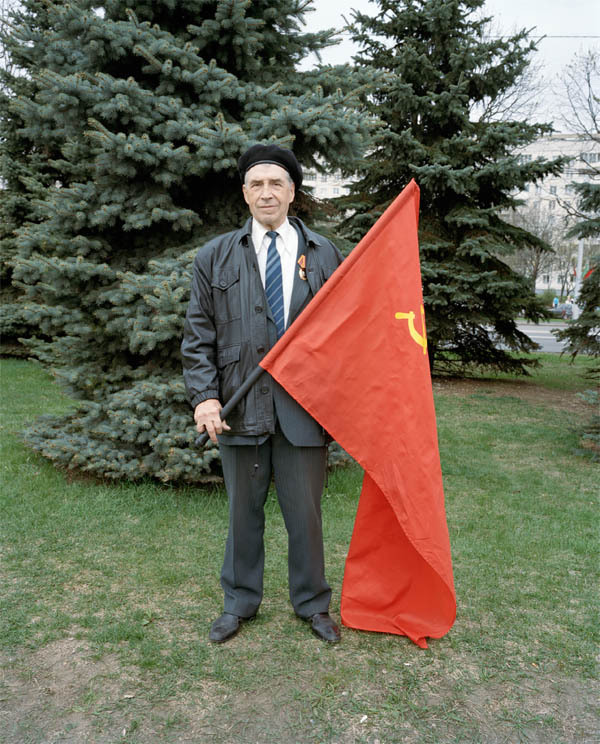 Man with USSR Flag, May Day, Minsk, 2010. Girl with Flowers, Belarussian Independence Day, Minsk, 2010. 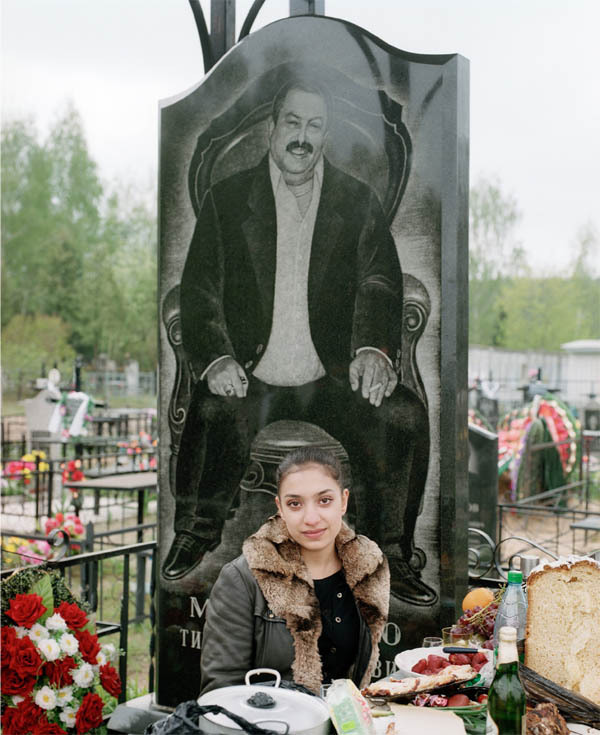 Romani Girl in Cemetery, Radunitsa Holiday, Gomel, 2011. Chaika automobile, Radunitsa, Gomel, 2011. Grave Offerings, Radunitsa, Gomel, 2011. 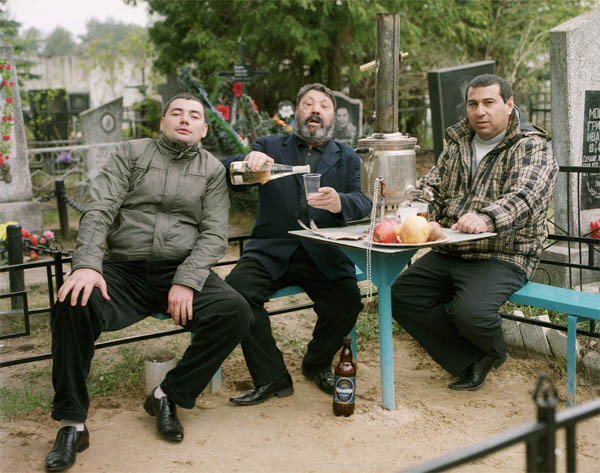 A Drink for the Dead, Radunitsa, Gomel, 2011.